Ernie Els suffered more misery on the opening hole at Augusta National as the second round of the Masters got under way on Friday. Els started his first round by six-putting the par-four first to run up a quintuple-bogey nine as his battle with the dreaded 'yips' resurfaced in heartbreaking fashion. And there looked to be no end in sight to the four-time major winner's problems as he missed from two feet to three-putt the same hole and begin his second round with a double-bogey. Els had pulled his approach into the crowd on the 445-yard par four, hitting, but thankfully not seriously injuring, a male spectator. The 46-year-old then hit a poor pitch and left his par attempt two feet right of the hole. After checking he would not be standing on the line of playing partner Matt Kuchar, Els then missed the bogey attempt to audible gaps of dismay from the crowd. Els was at least not alone in struggling on the greens, New Zealand's Danny Lee moving to within a shot of leader Jordan Spieth with a birdie on the second, only to then four-putt the third for a double bogey. That dropped Lee back to three under par, with England's Ian Poulter falling back to two under due to a bogey on the par-five second caused by pulling his drive into the trees. Spieth, who led from start to finish last year, had carded a flawless opening 66 to become the first player in tournament history to hold the outright lead in five consecutive rounds. But, despite dropping two shots in his last three holes to card an opening 70, Rory McIlroy was optimistic about his chances of claiming a first green jacket to complete the career grand slam. "He's very, very comfortable here," McIlroy said. "You look at the way he played in 2014 and 2015 and look at what he's done this year; it's a golf course he's comfortable on and he's going to be tough to beat this week. "I feel I'm going to have to play good golf, but I feel there's enough good golf in me so that I can reel him in over the next 54 holes." McIlroy was due to begin his second round shortly after 11am local time, with Spieth out almost two hours later. McIlroy's charge was halted with a double bogey on the fourth, where he found sand off the tee and compounded the error by three-putting from 20 feet for a double bogey. A poor chip on the next led to another dropped shot before the world number three crucially saved par from 12 feet on the sixth, having badly misjudged his birdie attempt. Without having hit a shot, Spieth's lead had increased to three shots as he began his second round, but Garcia then closed to within two thanks to a birdie on the par-five eighth. Welshman Ian Woosnam, the 1991 champion who has been struggling with joint pain, has decided to call time on his competitive run at the Masters after following his opening 10-over 82 with an 81. "I said in the past that if started shooting in the 80s, I would call it a day," said the 58-year-old, who has competed in 28 Masters. "I am in just in pain all the way round and you can't expect to play well. It's time for me to sit back and watch." A shock blunder from Jordan Spieth gave the chasing pack hope after the defending champion had threatened to turn the Masters into a procession for the second year in a row. Spieth, who was second on his debut in 2014 and claimed a first green jacket with a record-breaking wire-to-wire victory 12 months ago, held a two-shot lead after a flawless opening 66. And the world number two swiftly moved five shots clear of the field with two birdies in the first three holes of his second round as he looked to become just the fourth player after Jack Nicklaus, Nick Faldo and Tiger Woods to successfully defend the year's first major championship. 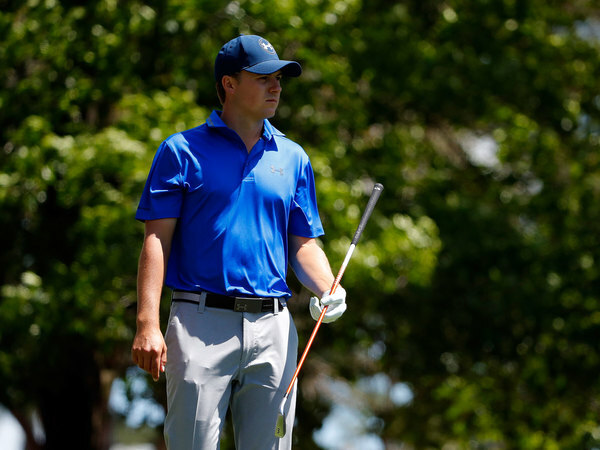 Spieth, who set records for the highest number of birdies (28) and lowest 36 and 54-hole totals in Masters history last year, holed from 14 feet on the first and just two feet at the third, after surprisingly missing from seven feet on the second. However, the 22-year-old then four-putted the fifth from 50 feet run up a double-bogey, bringing back unhappy memories of doing the same on the eighth hole in the final round of the Open at St Andrews last year. Chasing the third leg of an unprecedented grand slam, Spieth eventually missed out on the play-off by a single shot. Unfortunately for Rory McIlroy, his own problems meant he was still six shots off the pace after Spieth's unexpected mistake. McIlroy had been within two of the lead on Thursday before bogeys on the 16th and 18th and it was a case of deja vu for the world number three on Friday, who needs to win a green jacket to complete the career grand slam. Birdies on the second and third took McIlroy to four under par, only for the 26-year-old to double bogey the fourth, where he found sand off the tee and compounded the error by three-putting from 20 feet for a double bogey. A poor chip on the next led to another dropped shot before the Northern Irishman crucially saved par from 12 feet on the sixth, having badly misjudged his birdie attempt. However, a run of pars was followed by another dropped shot on the 11th which left the four-time major winner back on level par. Sergio Garcia had also been four under after birdies on the second, third and eighth, only for the Spaniard to take six on the ninth and drop back to two under alongside Soren Kjeldsen, Shane Lowry, Paul Casey and Justin Rose. Playing alongside Spieth, Casey also got to four under with a birdie on the second, but three-putted the third after a misjudged approach in the swirling wind and also dropped a shot on the next. 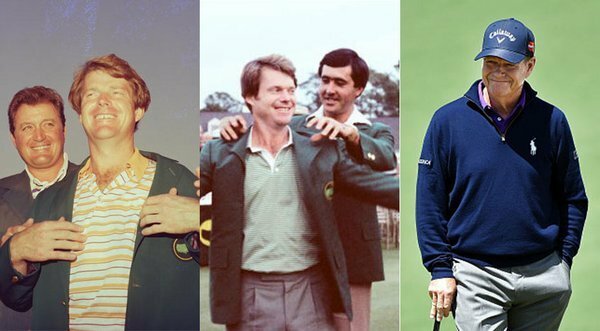 Ernie Els revealed his fellow players had given him "funny" looks after his battle with the dreaded 'yips' resurfaced in heartbreaking fashion. Els started his opening round at the Masters by six-putting the first hole for a nine, the highest score recorded on the 445-yard par four in tournament history. The 46-year-old admitted he was embarrassed to play out his struggles on the biggest stage, but restored some pride by adding a second round 73 to his opening 80, which included four birdies in the space of eight holes. "I slept okay but this morning I felt really down when I got to the course," the four-time major winner said. "People give you a funny look. "You feel quite embarrassed. I could not get myself going today. It was a weird, surreal feeling on the range. Even the players and caddies looked at me as if I did not any pants on, like I'd robbed something and got caught. It was not a nice feeling. "You play long enough you make a fool of yourself somewhere and I did it on the biggest stage." Ian Poulter endured a painful experience as his hopes of winning a first major title in the Masters were blown off course at Augusta National. Poulter began the day just three shots off the overnight lead held by defending champion Jordan Spieth, but stumbled to a 78 on Friday after carding four bogeys and a double bogey on the 14th. "It wasn't as tough as yesterday," the 40-year-old said. "It's just disappointing to be marginally off around this golf course because that just shows you how difficult this golf course really is. Margins for error are really slim. "You are always on edge on this golf course, especially when this wind is blowing. It's tough, but that's why we love this golf course. I walk off and shoot six over par, but I still love this golf course because it has given me what I deserved today, which is a right kick in the nuts." Another par for Spieth at the 12th - he'll be hoping to extend out that lead again in these final few holes. Spieth just misses out on a birdie putt and he's left himself a little bit of work to do on the 14th. Spieth sinks it - and in the end makes it look easy. Meanwhile, Casey bogies to drop back to -1 overall. Rory McIlroy set the clubhouse target on a windswept second day of the Masters, as defending champion Jordan Spieth battled to maintain his lead and his composure. Seeking a first green jacket in order to complete the career grand slam, McIlroy's chances looked slim when he followed two early birdies with a double bogey on the fourth and bogeys on the fifth and 11th. At that stage he was eight shots behind Spieth after the world number two birdied the first and third in pursuit of becoming just the fourth player after Jack Nicklaus, Nick Faldo and Tiger Woods to successfully defend the year's first major championship. However, Spieth who set records for the highest number of birdies (28) and lowest 36 and 54-hole totals in Masters history last year, then four-putted the fifth from 50 feet run up a double bogey, bringing back unhappy memories of doing the same on the eighth hole in the final round of the Open at St Andrews last year. A birdie on the eighth looked to have steadied the ship, but Spieth then bogeyed the ninth and 10th and was visibly - and audibly - annoyed at being timed for slow play as he wanted to wait for the wind to die down on his approach to the 11th. McIlroy took full advantage with birdies on the 13th, 15th and 16th and the fist pump when he saved par from the trees on the 18th told its own story. US Amateur champion Bryson DeChambeau, who was playing alongside Spieth, had birdied the 11th and 12th to join McIlroy on three under, whose 71 equalled the lowest score of the day and left him one ahead of Danny Lee and Scott Piercy, who were also safely in the clubhouse. "It was very difficult," McIlroy told ESPN. "It's very hard to select a club. On the 12th tee I felt a little lull in the wind and hit it straight away. Once you get it where you feel it you have to hit it and trust it which is the hardest thing out there. I think anything under par today is a very good score. "I definitely feel like I am coming in with not as much hype or anticipation as last year. You have Jordan as defending champion, Jason (Day) getting to number one off a couple of wins, Adam (Scott) having a couple of wins - I felt I was just part of the narrative instead of just being the narrative and I like that position. "I feel great. I feel so much better than I did yesterday. I played the last three holes on two over and today I played last six holes in three under today so I am really happy with how I battled and ground it out and I'll have to do the same tomorrow." Tom Watson has played his final round at the Masters - emotional scenes on the 18th. Bryson DeChambeau drops back one with a bogie at the 16th. Spieth does the same and so does Casey. Bad hole for the most intriguing group. Bogey for Spieth at the 17th - this is really tightening up. DeChambeau manages a par though - he could split Spieth and McIlroy in tomorrow's pairings. Spieth on the 18th and he's found the bunker - might he end up level with McIlroy by the end of this round?